Given that temperatures in the combustion chamber are crazy high, are there any pressure sensors rated for the high temperature and high pressures located there? Or is there a cooling mechanism for the pressure sensors? The pressure sensors do need to be shielded somehow from the full fury of the combustion chamber. 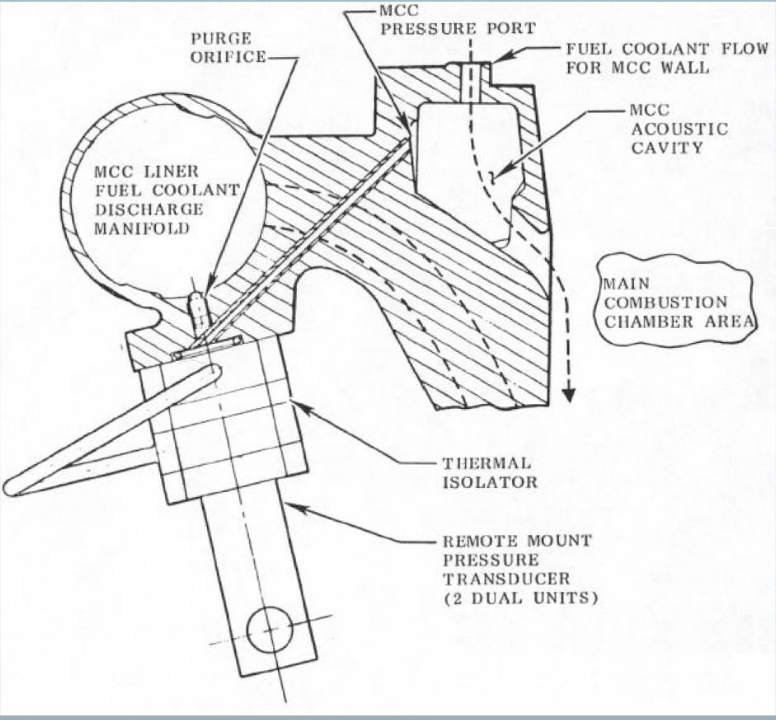 Here's a schematic showing the connection of the Space Shuttle Main Engine chamber pressure (Pc) sensors to the combustion chamber. You can see that the Pc sensor is not connected directly to the chamber, but interfaces with it via a hole drilled up to one of the acoustic cavities, which is cooled by fuel flow. Also note the "thermal isolator". This arrangement was not foolproof, the "purge orifice" aka "lee jet" caused several failures during development and testing. You can read about them in the reference. I don't have details, but the sensor was certainly "rated for high temperatures and pressures" even with this arrangement. I assume you talk about average static pressure, not total pressure or high frequency acoustics. If this is untrue then please clarify the question. A boundary layer gets it's pressure from the main flow. Therefore it is not necessary to hold a pressure tap into the main flow. A thin tube (a capillary) is attached radially to the side wall. The longer the tube, the more fluctuations in pressure will be attenuated, but the cooler the gas is at the sensor. It is important to make the tube long enough that the sensor doesn't get burned. There is very little gas moving in or out of the capillary, so typically no special cooling is needed. Not the answer you're looking for? Browse other questions tagged rockets engines combustion . What is meant by chamber pressure in rocket engines?